[THIS IS FOX'S longest case study (nearly 1500 words) and his strangest entry for it involves no discussion of treatment or conclusions as to the cause.] Six years before the photographs were taken he received a blow on the outer side of the right eye-ball. Shortly after a minute black speck appeared on the site of the bruise, which steadily, though slowly, increased in size. Small tumors appeared later on various portions of the body. 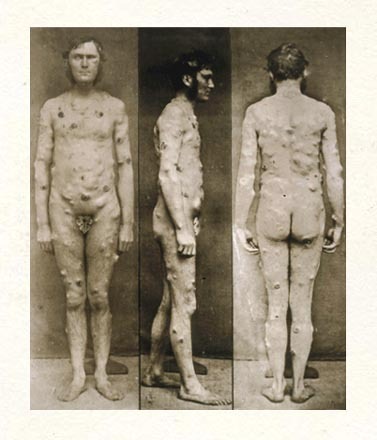 In June, 1874, there were about forty or fifty tumors, varying from a slight nodosity to a large horse-chestnut in size. One of hazel-nut size on the right temple was excised to relieve the deformity. The tumor was friable in structure, and almost black in color. Microscopically a great excess of pigment matter was found, and many large cells, with two or even three nuclei. The urine was of a smoky color. The prognosis which had been made in his case rendered him despondent. From this time forward the development of the tumors was pretty rapid, new ones being discovered almost daily. The general surface of the skin grew darker. All of the tumors are decidedly hard and firm to the feel. Some of them are colored, of various shades, from a greenish brown to a deep blue-black. After having attained a certain size, or rather height, they become first of a purplish color, which deepens until of a deep black. The subsequent history of the case can be told in a few words. The patient rapidly lost in strength and flesh, and the tumors continued to develop anew and reappeared in the site of those excised. In six weeks he was in a greatly depressed state. He remained in the hospital about three weeks, and died there on May 16. He failed rapidly, becoming more and more bronzed, until, at the time of death, the general melasmic state of the skin was very striking. Autopsy, May 17, 1875. The entire skin is of a dark color. The substance of the brain is not pigmented and appears normal, but black nodules are found in the liver. On the right eye close to the outer edge of the cornea, is a small black nodule, the size of half a grape seed. in a frenzy of small and briaring fists? Where had you driven then, William? And what did you see? Tell us; be shriven. and made your liver as black as ill augury? Some Olympian spied in Brooklyn? A ritual intruded? A passion curtailed? because he saw what he should not see? as in days when gods ate with untroubled appetite? to a whirling monotony where there is none. with perfect resonance—negate it all. be the picture of negated harmony? that struck the eye of William R.
absurd and meaningless . . .
speeding toward a bright and opened eye.